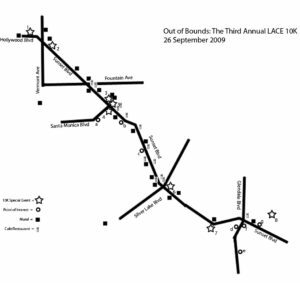 LACE (Los Angeles Contemporary Exhibits) invites you to take to the streets as we present an afternoon of clandestine surprises with Out of Bounds: The Third Annual LACE 10K on 26 September 2009. Join us on this year’s annual fall membership drive which pushes the envelope (yay!) of the traditional “art walk” (snore) by curating a series of exhibitions and performances along a 2 mile stretch of Sunset Blvd. from Barnsdall Art Park in Los Feliz to City Sip in Echo Park. And the best part is… Out of Bounds is free to LACE members! Join as a LACE Friend for only $50 and take part in this all day excursion! – Orphans and Kitties Go to the Circus at Circus of Books, curated by Kristen Calabrese and Joshua Aster. Featuring work by artists including Kenny Scharf, Mary Weatherford, Eamon Ore-Giron, Ami Tallman, Sandeep Mukherjee, Amir Fallah, and dozens more. A complete list of artists is available at LACE. All works will be available for purchase with the proceeds going directly to the artists. – Media artist Jeff Knowlton will embed special codes at various spots along the route that will allow you to download content directly to your Smartphone. For keeps! – Picnic with HumanEar musicians as they take over Mi Alma art park for a showcase of improvisational performances. session the history of Silverlake’s art community. – Stop by the HubbyCo installation at Art & Shelter. – Check out a special selection of work at the Tom of Finland Foundation, selected especially for Out of Bounds by Tony Payne. – Sit back and relax with a special Out of Bounds selection of wines as we conclude our day at City Sip. – Receive a complimentary limited edition Out of Bounds t-shirt! But in order to participate, you gotta be a member! Membership plays an important part in helping LACE maintain its role and legacy as a leader in the Los Angeles art world. Your participation as a LACE member is an investment in maintaining Los Angeles’ position as a thriving center for contemporary art and in continuing LACE’s role as the premiere venue for work that is new, untested, experimental, and controversial. Snacks and refreshments will be provided by Whole Food Market Arroyo Pkwy. Support for LACE and its programs is made possible by support from The Andy Warhol Foundation for the Visual Arts, the City of Los Angeles, Department of Cultural Affairs, The Getty Foundation, Hollywood Chamber of Commerce Community Foundation, The James Irvine Foundation, Jockey Hollow Foundation, Los Angeles County Arts Commission, Morris Family Foundation, The Pasadena Art Alliance, Side Street Projects, Skadden, Arps, Meagher & Flom LLP, Stone Brewing Co., and the members of LACE. Barnsdall Art Park is seated on the crest of Olive Hill with gorgeous views of the surrounding Los Angeles landscape. This beautiful art park is home to the Los Angeles Municipal Art Gallery, Barnsdall Gallery Theatre, Junior Arts Center, and the famous Hollyhock House designed by Frank Lloyd Wright in the 1920s. The park got its start in the early 1900s when Aline Barnsdall came West dreaming of developing a theatre company. She later donated the land and its famous architecture to the City of Los Angeles in 1927 with the intention of fostering a long-lasting center for community art development and exploration in all of LA’s cultural diversity. Out of Bounds embarks from Barnsdall along Sunset Boulevard at 1 PM. Established in 1986, La Luz de Jesus Gallery is one of the fifteen Silverlake galleries that held a collective objective “to bring underground artists and counterculture to the masses.” Dubbed “the Peggy Guggenheim of Lowbrow,” director Billy Shire continues to foster a particularly Los Angeles-flavored art style, ranging from folk to outsider to religious to sexually deviant. Artists such as Manuel Ocampo, Joe Coleman, and Robert Williams have all contributed to La Luz’s wild and fanciful history. Kristin Calabrese and Joshua Aster have joined Out of Bounds as the curators of Orphans and Kitties Go to the Circus. This exhibition consists of paintings made with only one restriction: to be no larger than 11 inches in any dimension. Calabrese and Aster’s exhibition was recently shown in Milwaukee, and now makes its grand debut in Los Angeles at Circus of Books. All work is available for purchase with proceeds going directly to the artists. Mi Alma Collective of Silverlake simultaneously houses the beautifully handcrafted chandeliers of Charles Marder in the grand studio and an adjacent art park for community events, gatherings and exhibitions. Opened only six months ago, Mi Alma (‘my soul’ in Spanish) seeks to enliven the Silverlake community by providing a space for locals to engage each other through art, music, and performance. Mi Alma’s art park hosts the improvisational performances of HumanEar. Dedicated to the visual, musical and multimedia practices of visionary and self-reliant artists, HumanEar was founded in 2006 by Jason Grier and Julia Holter. The organization holds events, organizes projects and makes records. HumanEar musicians will situate themselves in the Mi Alma art park for a showcase of music performances and a participatory Bataillean Yoga class. Jeff Knowlton’s computer-based artwork focuses on locative media. Mr. Knowlton is a recipient of a New Forms Initiative Grant funded by the NEA and the Rockefeller Foundation and teaches at UC San Diego in the Interdisciplinary Computing Arts Program. For this event he has collaborated with artists Emily Hochman (drawings) and Jeremy Hight (text and photographs) to produce multimedia content that can be downloaded directly to your smartphone via QR codes posted along the event route. Tony Payne is an artist, curator and UCLA-trained graphic designer who joins Out of Bounds as a guest curator. Mr. Payne also currently runs Phil Gallery in Highland Park. “I want the space to feel like a curated interior,” says Payne. “I’m interested in how art and objects live together and inform one another. Phil is all about making those links.” See the exhibit of artworks specially selected by Mr. Payne at the Tom of Finland Foundation. Mecca Andrews established the MOVEMENT movement in 2007 in an effort to share artful movement with audiences, communities and strolling folks. Some recent artistic partnerships involve Phillis Stein Art Gallery, LA Contemporary Dance Company, Santa Monica Museum of Art, Basement Jaxx, and Los Angeles Philharmonic. Mecca also serves a wide community of people as an instructor of dance at Edge Performing Arts Center, Crenshaw Yoga and Dance, Heartbeat House, and Katnap Dance. City Sip was founded by wine-enthusiast Nicole Daddio, whose mission was to “bring the vineyards to the city.” Our final stop is not limited solely to being a wine bar, City Sip also offers classes and events for wine-lovers, from the expert to the oblivious. LACE members will be given the opportunity to sign up.